What would that accomplish that would not be worse than using an image rotor and designing your own HUD elements that way? Being able to specify an entire HUD via a table without adding in additional assets? Sounds kind of neat actually. Yes, it's actually the same principle behind using CSS instead of images on a website. Pretty common these days to avoid loading a lot of extra assets when the CSS file can contain everything, and often for much lower overhead when the heavy work of actually rendering many shapes and features is already set up in the rendering engine, and you just need a few text bytes to tell it what to do. Plus, a system like that could scale infinitely to any resolution. The only graphics type that could claim to have that ability is SVG, which is already a text file format anyway. I just have no idea how performant using libRocket to render HUD elements in real time could actually be. Although there might be a middle ground, using libRocket during game/mission load to render HUD assets into memory at the specified resolution. Web design isn't a great analogy because you still use image assets to do anything truly unique, but I get it. And I don't disagree at all. It just tickles me a little because of course this makes sense for people who are used to staring at code. As a visual designer, designing purely with code sounds awful! I don't see why such a system couldn't also use images, making it even more analogous to web design. Besides, a lot in web design can be done without images today, when they couldn't "back in the day". HLP itself only uses images for the logo, the user avatar, and some little icons, as far as I can tell. Some of these icons could even be replaced by CSS shapes. I just have no idea how performant using libRocket to render HUD elements in real time could actually be. Although there might be a middle ground, using libRocket during game/mission load to render HUD assets into memory at the specified resolution. 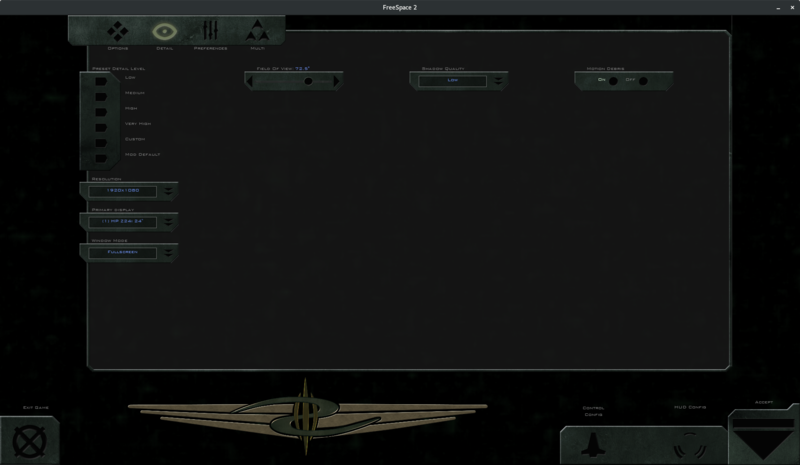 I haven't run any benchmarks yet but it looks like libRocket would be fast enough to use it for rendering the HUD. That will require an entirely new system though since then I would like to use a Model-View technique to reduce the amount of code that would need to be ported to Lua. Hlp uses at least a few more images than just the logo. There's some icons and banner backgrounds that have the logo at the very least. But if course that's why I said "unique". A purely code design could not make anything at all like FS2's default interface. But yeah, m!m brings an excellent point. librocket is just not capable of anything like modern websites. All option types (selection, range, binary) are supported now so now I only have to port over the various options. You can now download the HD UI test mod on Knossos. The released version has all our work up to the barracks. I think the options UI is now ready for an initial test. I updated the mod in the first post (you will need new libRocket test builds). The options should already work in-game so you can test that as well. I've tested the latest build lately, and I've found out the issues on the options, especially on the detail tab. Apparently, the options don't save itself for some reason after exiting the options menu following some changes. What of loading screens and mainhalls? Will the latter support rocketlib in some capacity? You need to express yourself more clearly. Your description is absolutely useless for me. I mean, there are some issues found after testing the latest build. The options did not save itself for some reason after clicking accept. On 800x600 resolutions and lower, the fonts and UI look distorted in the screenshot below. I do not think, that 800x600 is appropriate to be called "High Resolution" in modern times.